The International Fundraising Congress (IFC) conferences are world-renowned networking and educational opportunities where delegates and speakers come together to share their industry knowledge and expertise. We’re thrilled to announce the lineup of IFC Holland 2018! 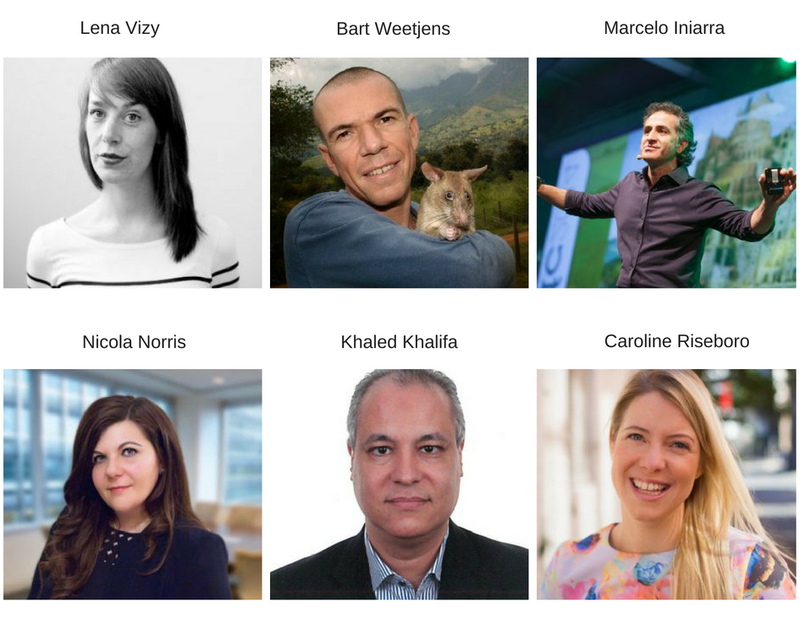 Our speakers are influential industry leaders that will be bringing you their unique and diverse perspectives from 30 countries and 6 continents. Fun Fact – Lena joined the fundraising team at Amnesty in 2013. Previously she worked as a Marketer for the National Opera and Ballet of the Netherlands and The Dutch Opera. Fun Fact – Bart initiated the use of trained giant African pouched rats (HeroRATS) as an alternative and sustainable landmine detector, in response to the global landmine challenge. Fun Fact – Marcelo was one of the global pioneers of digital mobilisation in the social sector, leading the design and implementation of cyberactivism and fundraising at Greenpeace International. Fun Fact – In 2017, Caroline was named Canada’s Top 100 Most Powerful Women in the trailblazer category and she is credited with launching campaigns that have engaged Canadians on some of the world’s toughest issues. Fun Fact – Nicola has dedicated her career to increasing fundraising revenue for several NGOs including Greenpeace, the Heart Foundation and Amnesty International. At IFC Holland, you will have your choice of deep-dive Masterclasses, interactive Workshops, inspiring Plenaries, engaging Resource Cafe sessions, and Big Room lectures. Your expert speaker will guide you through powerful learnings and interactive conversations, and you’ll come away with actionable solutions. You’ll gain a wealth of practical, strategic learnings boiled down into 90-minute helpings served up by some of the most focused practitioners in the social impact sector. The more intimate setting and less structured agendas are well suited to a lively Q&A format and an overall feeling of ‘Together We Can’ among everyone in the room. It’s all about The Big Picture: Bigger-than-life speakers, in front of a big crowd on a big stage in a big room, talking about The Big Issues. Our opening and closing plenary sessions are specially created for IFC Holland. They are designed to inspire, to educate, and to challenge you to stretch your heart and mind, your ambition and your self-belief. With over 1000 delegates and over 100 speakers, at IFC Holland, you’ll be gaining up-close-and-personal access to the leading changemakers of the social impact sector. Strike up a conversation about journey mapping over coffee. Learn about digital innovations from a new friend at a cocktail reception. Trade stories about rethinking fundraising strategy while dancing at the IFC Holland Gala. And for more structured networking opportunities, don’t miss Lunch & Learns, Power Hours, and Special Social Sessions like yoga and wellness activities. And don’t forget to “be social!” Connect with your new friends and colleagues on LinkedIn, Twitter, and Facebook and be sure to tag #IFCHolland in your posts! The Resource Alliance was founded in 1981 as a support network to keep delegates connected and engaged between conferences. Today’s Resource Alliance still serves as a bridge from IFC to IFC, but its role and reach have expanded to include myriad education and leadership training opportunities, and a mission to foster and support collaboration within the global social impact sector. At IFC Holland, you’ll have the chance to meet our team, learn about our global IFC events and impacts, and to discover how you can become an active member of our community. Don’t be shy when you see one of us! We’d like nothing more than to tell you more about our Mission! You’ll hear new stories, new perspectives, enjoy specially curated sessions that you won’t see anywhere else, including our opening and closing keynotes, and you’ll discover that you are part of an amazing global movement for change. How do you get from one of the darkest places imaginable, to a place of empowerment, even joy? Listen to this closing plenary from Esther Dingemans, Director, The Dr Denis Mukwege Foundation, and you will begin to understand how such an extraordinary journey can be possible. There’s no end to the chances and connections you won’t make if you don’t join us from 16-19 October, so register today for IFC Holland! And thanks to our corporate travel partnership with Dutch airline KLM, they are kindly offering discounted flights to and from Amsterdam Schiphol for IFC delegates. When you book your tickets through us, you’ll be eligible to receive 15% off your KLM flights to IFC between 10-24 October 2018. That means you can schedule a few days before or after the conference to explore the beautiful canals, historic architecture, and exciting cultural attractions of Amsterdam!